If you are not able to sign in to ArcGIS Pro, you may see one of the error messages below. 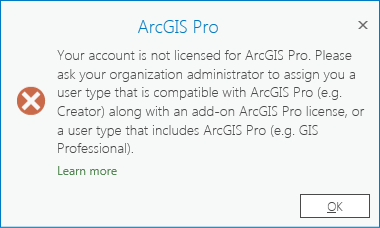 The message Your account is not licensed for ArcGIS Pro means that you are a member of an ArcGIS organization but your account is not configured to use ArcGIS Pro. This message has two versions. In the first version, your user type is not compatible with an ArcGIS Pro license. In the second version, your user type is compatible with an ArcGIS Pro license, but a license has not been assigned to you. Every ArcGIS organization member has a user type, which is assigned by the organization administrator. The ArcGIS Professional user type is assigned an ArcGIS Pro license automatically. The Creator user type can be assigned an add-on ArcGIS Pro license by the administrator. Other user types are not compatible with an ArcGIS Pro license. If you get either of these messages, contact your ArcGIS organization administrator. Depending on the message, ask to be assigned a user type compatible with an ArcGIS Pro license or to be assigned an add-on license. If you don't know who your ArcGIS organization administrator is, see Find your organization administrator below. If you are the organization administrator, see Change user types in the ArcGIS Online help topic Manage members. See also Assign Named User licenses in ArcGIS Online. The message Your account could not be used to authorize ArcGIS Pro because it is an ArcGIS Public Account means that your account is not part of an ArcGIS organization. An ArcGIS public account has limited access to ArcGIS Online and does not allow you to use ArcGIS Pro. You can confirm that your account is a public account by signing in to ArcGIS Online from a web browser. If the URL is www.arcgis.com/home/index.html, your account is public. An ArcGIS organization account has the form www.<orgname>.maps.arcgis.com/home/index.html. If you don't have an ArcGIS organization account, you can sign up for an ArcGIS free trial that includes an ArcGIS Online organization and access to ArcGIS Pro, ArcGIS Pro extension products, and other apps. Sign in to your ArcGIS organization account from a web browser. On the Home tab, click the Contact Us link at the bottom of the page to send an email to your organization administrator or contact person. If the Contact Us link is not present, it means that the organization administrator has not enabled this setting. Alternatively, after signing in to your ArcGIS organization account, click Organization at the top of the site. On the Overview tab, your administrative contact (or contacts) are displayed in the upper right corner of the page. Click the administrator's name to access their profile. If you aren't able to determine who your administrator is, contact Esri Customer Service for assistance.